Former prime minister says 'Case 3000' borders on treason, says Netanyahu needs to resign. Former Prime Minister Ehud Barak alleged that a recent submarine procurement scandal known as 'Case 3000' was "treasonous" and called on Prime Minister Netanyahu to resign over the affair. Police on Wednesday had recommended that Netanyahu's cousin and attorney David Shimron be indicted for bribery for his role in the 'Case 3000' investigation. The probe centers around allegations that Shimron pushed for a multi-billion shekel deal to purchase new submarines from German conglomerate ThyssenKrupp, which was a client of Shimron's. Speaking at a cultural event in Nes Tziona on Saturday, Barak said that Netanyahu needed to resign over the scandal. "In any normal country, Netanyahu would have handed in the keys and resigned from his position," Barak alleged. "It is his ministerial responsibility." "This is a very serious affair, and we have been informed that the PM is not involved in this. 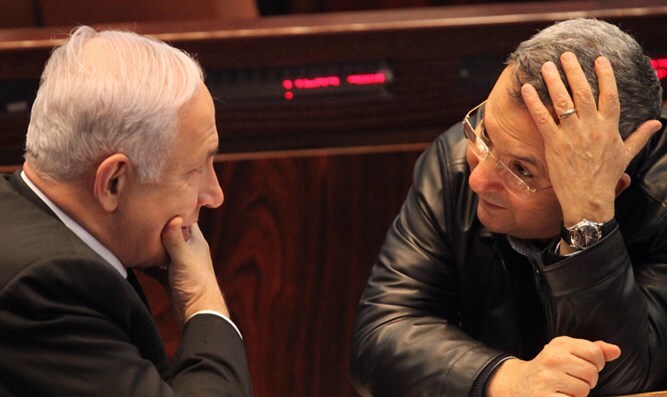 I tell you as a witness - I know Netanyahu since he was a young boy, and I have been following him for many years, and I also won him in the elections, both in the IDF and in the cabinet he was elected to head," added Barak. "In the end of the day, Netanyahu's close circle was involved in this. This is borderline treason." The Likud responded by accusing Barak of corruption after recent reports said that he was paid large sums of money by a US-based foundation for undislosed research work. "Ehud Barak, who refuses to reveal for what research he received $ 2.4 million from the Wexner Foundation, blames the prime minister with false accusations after it was determined that there was no flaw in his actions. Where are the shouts over the fact that he called the prime minister a traitor?" asked the Likud.